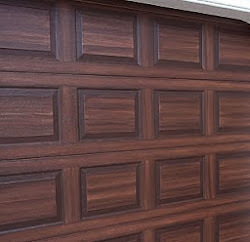 I have made some good progress on the current project of painting a carriage style garage door to look like wood. 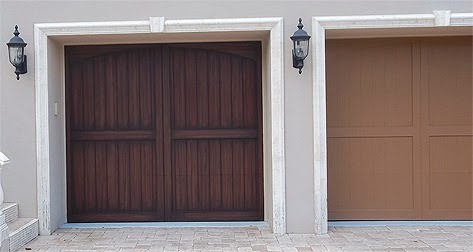 Here is a side by side photograph showing a completed door next to one that has only been base coated. A pretty big difference I'd say. Each door will get 56 clavos attached to it. The next photo shows one of the those on the right side of the door, see the round black dot. They will be attached at the top and botton of each plank on the uppper and lower sections of the doors. 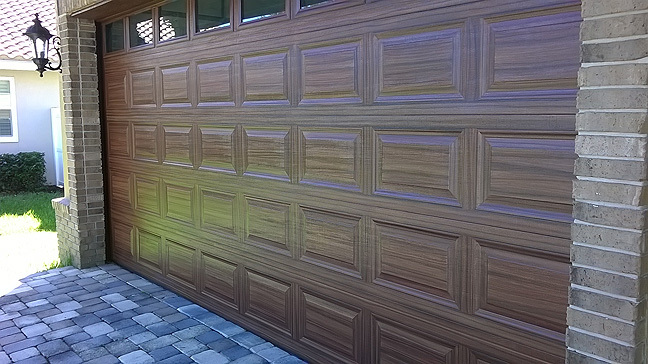 You can not tell from the picture but the clavos have a rustic 'hammered' texture on them.